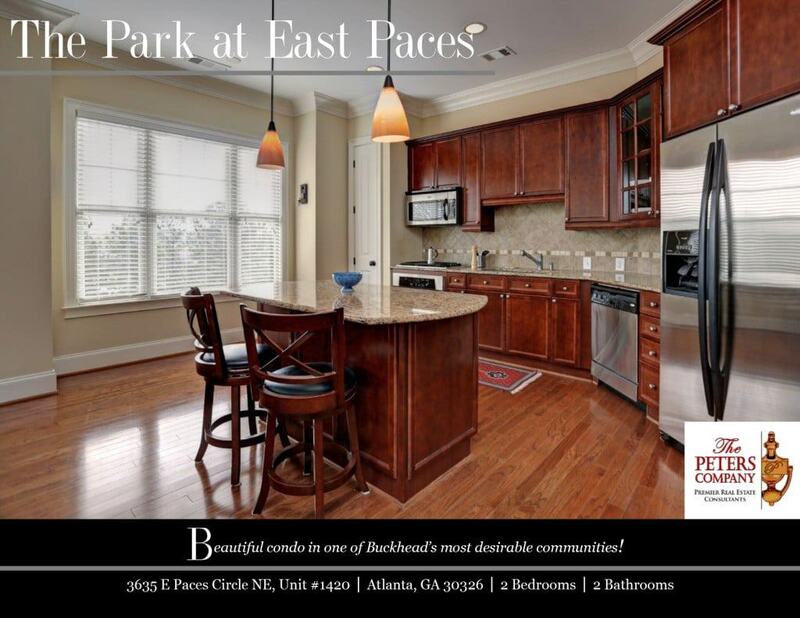 Just Listed :: Amazing Buckhead Condo at The Park at East Paces! Welcome home to this wonderful two bedroom, two bathroom condo in the heart of Buckhead. The open floor plan, custom features, and charming character will never go out of style. The close proximity to Peachtree Road, I-85, I-75, and GA400 makes it convenient to and from any direction. You’ll love having easy access to all of your favorite Buckhead restaurants and shopping spots! You’ll truly be in the middle of it all! · Gleaming hardwood floors, tall ceilings, and gorgeous trim work throughout. · Kitchen features stainless steel appliances, granite countertops, pantry, and island with breakfast bar. · The living room boasts a cozy gas fireplace and tons of natural light. · The master suite features a large walk-in closet and spa-like bathroom with double vanity, garden tub, and separate shower. · Additional bedroom is well-sized and bright with easy access to the hall bathroom. · The private balcony provides additional living and lounging space. · One deeded parking space and storage unit. · Wonderful community amenities include a salt water pool, dog park, club room, gym facilities, gated entrance, and secure building access. · Great location convenient to interstates, Marta, shopping, restaurants, Lenox Square Mall, and Phipps Plaza!